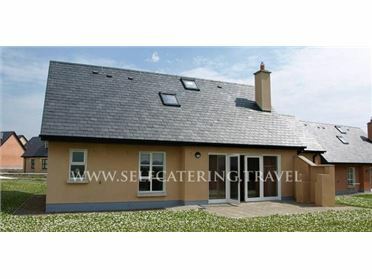 Quiet Man's Cottage is a lovely detached cottage is situated in the village of Mayo Abbey just ten miles from Castlebar in County Mayo. The cottage can sleep four people in one double bedroom and two single bedrooms together with family bathroom. Also in the cottage is a kitchen with dining area and a sitting room with woodburner. Outside is off road parking for three cars and a private enclosed garden with patio and furniture. Quiet Man's Cottage is a superb base from which to explore this fascinating part of Ireland. Today, the village is a beautiful, tranquil hamlet. Oil fired central heating with woodburner. Electric hob with halogen oven, microwave, WiFi, fridge, freezer, washing machine, tumble dryer, dishwasher, TV with Saorview. Fuel, power and starter pack for woodburner inc. in rent. Bed linen and towels inc in rent. Off road parking for 3 cars. Private enclosed front, side and back gardens with patio and furniture. Sorry, no pets and no smoking. Shop and pub 1 mile. Note: There are a number of steps and low door frames throughout the property so care should be taken..